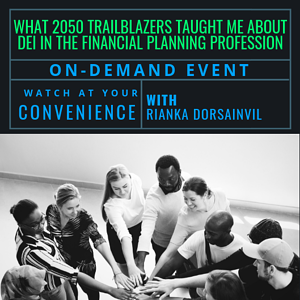 In this on-demand webinar, XYPN member and Investment News' Women To Watch Rising Star Rianka Dorsainvil explores why she decided to start her well-known Diversity, Equity, and Inclusion (DEI) podcast, 2050 TrailBlazers. She shares her motivation behind using a podcast as a communication medium, her reasons for addressing the topics that she has, and what she's learned from her guest interviews. Learn how Rianka is shaking up the industry and making it more inclusive and educated at the same time. On a mission to make financial planning accessible for young professionals and entrepreneurs, Rianka Dorsainvil, CFP®, is already the CEO of her own financial planning firm, Your Greatest Contribution, and has been a go-to financial expert for the nation's top financial media outlets. As a CFP® professional, Rianka can make a tangible impact on her client’s lives, maintain a work/life balance, and help advance the profession by building relationships with other financial planners at various stages in their careers. Rianka hosts her own podcast, 2050 Trailblazers, which focuses on diversity, equity, and inclusion in the financial planning industry.